TUMC has an organic culture where individuals can get involved and strike up new initiatives, suggest changes, or help to organize and run parts of the church. We have a congregational / community-oriented decision making process and culture. The church board is a group of committed members of the congregation that pays special attention to matters of the business, spiritual direction, and vision of the church. At any given meeting of the TUMC board, topics might include logistics and dates for church events, how we might renovate a building, or whether we should kick off a new missions project or sponsor a new refugee family. 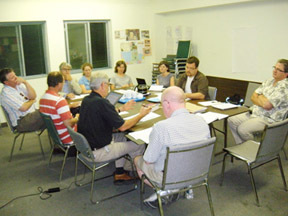 Board members are also members of the congregation, and are deeply involved in many aspects of congregational life. In addition to committee chairs and pastoral staff, the board has a secretary, treasurer, chair, vice chair, and past chair. You can speak to any board member to find out more about what is happening at the church, to find ways to get involved, or to speak up and be heard. Just remember, a suggestion for something to be done may be heard as a desire to volunteer! © Toronto United Mennonite Church 2019. Transcend theme by CPOThemes.